Vestas, a wind turbine manufacturer, has honoured Schaeffler with the “Best Support to Profitable Growth” award for its outstanding performance as a supplier. Schaeffler and Vestas intend to further develop their cooperation in the future. Vestas is a technological leader and one of the largest manufacturers in the wind turbine sector. The award given to Schaeffler is named after Vestas’ company strategy: “Best Support to Profitable Growth”. Vestas recognises its suppliers annually in three different supplier awards categories. 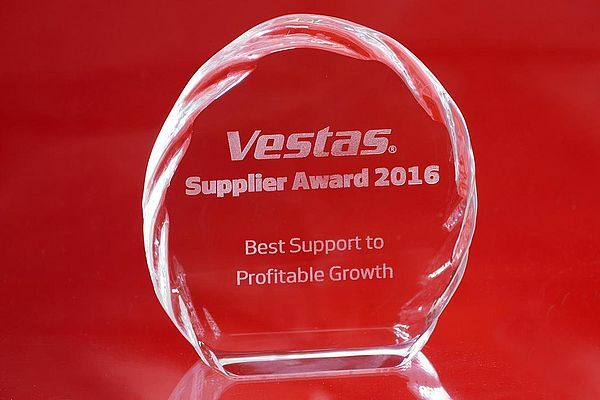 In the “Best Support to Profitable Growth” category, Vestas honours the supplier that provides the best support in helping it to achieve profitable growth. Schaeffler supplies Vestas primarily with special spherical roller bearings, which support the rotor shaft in 2MW and 3MW wind turbines. As one of the world’s leading rolling bearing manufacturers and a development partner to the wind turbine industry, Schaeffler has been producing bearings for wind turbines for more than 30 years.